The start of university life can be an expensive time, especially for those students from less privileged households. One mother, whose daughter was killed by a drug-driver shortly before graduation, is on a mission to help young people from such backgrounds achieve their dreams. Watching your daughter walk on stage to collect her degree should be one of the proudest moments of a parent's life. For Novlet Nicholson, things were not so simple. As she climbed the steps to collect a first-class law degree on behalf of 21-year-old Demi, her emotions swirled. "I was extremely proud but at the same time it was very upsetting because I knew how hard she had worked for that day," Novlet said. "It was a day she had always looked forward to. While I was watching the other students I kept thinking in my head, 'she should be here to collect it herself'. At the point they gave me the certificate I broke because it was a bit too much for me." In January 2017 while at home in Birmingham, Liverpool Hope University undergraduate Demi packed her bags and left her room - a shrine to her idol, the rapper Drake - to head north. She had just spent Christmas with her family. The third-year student, described as a good talker, had managed to get the whole festive period off from her part-time job in Boots. But now she needed to drive up the M6 to work her first shift of the new year. A few miles outside Birmingham, her Vauxhall Corsa broke down and struck the central reservation. Moments later, a drug-driver hit Demi's car. Novlet, 50, who has two other children, remembers: "About an hour after the crash I got a phone call saying she had been involved in a car accident. "That was the worst phone call I have ever had. Police came and blue-lighted me to the hospital and then it was a matter of hours before they switched off the machine. It was absolutely devastating and the worst day of my life." Adrian Ferarah, 45, of Wyndhurst Road, Stechford, was jailed for four years and eight months in January 2018 after admitting causing death by careless driving while under the influence of drugs. Novlet said: "I never, ever thought this would happen. You don't ever think you're going to bury your daughter." Image caption The Liverpool Hope University student was described as "very loving and vibrant"
She and her family were determined to find something positive to focus on after the loss of Demi, despite their grief "still being very raw and every day a battle". "So many people have come up to me and said they were upset when Demi died because she used to motivate them and we wanted to carry on motivating them and helping them financially," said Novlet. "Especially when you come from these kind of areas where people are less fortunate." Demi grew up in Winson Green, a deprived part of Birmingham on the edge of the city centre. From the age of 11 she knew she wanted to study law, her mother said, and worked hard to fulfil her ambition. 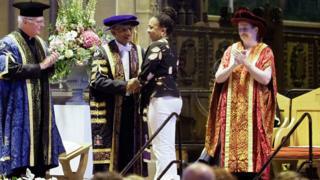 Demi, who wanted to become a barrister, became the first person in her family to go to university. "There are gangs in this area and you see a lot of stuff going on around here," Novlet said. "She did not want that for herself and knew the only way out of this was by focusing on studying and getting something positive. "It does not matter about your environment, it is about you applying yourself - and that was Demi's ethos." The family set up the Demi Trust - an acronym for Dream Enormous, Make an Impact. It provides sixth formers and college students from underprivileged backgrounds with starter packs worth £80, containing essentials for life in halls of residence. The trust also helps students around the country by giving them vouchers to buy the items. The trust also directs students to other organisations that can offer support and encourages young people to pursue their ambitions. Explaining her inspiration for the trust, Novlet said: "I knew for a single-parent family it was hard financially sending a child to university, I thought other parents must be experiencing the same difficulties and it would be nice to help them. "As young people, when your parents are going through difficulties, you don't want to cause them even more stress. "Some of the feedback we've had from the students is that it has been a lifesaver because they didn't know where they were going to get this money from. "It is a worthy cause and I hope it goes from strength to strength." Are universities letting down black students? Student Paris Williams, 20, originally from York, said the vouchers "took the pressure off her mum" when she started her politics, philosophy and economics course at Goldsmiths, University of London. She said: "I'm from a single-parent background, so my mum works a lot of hours, bless her. It was a big move, with the expense of train tickets and posting my stuff as she doesn't drive. So it just took a little bit off pressure from my mum, as your student loan does not drop until you actually register at university." Novlet is now busy preparing for the trust's second annual fundraising ball at Villa Park, on 6 April. It comes as the Office for Students has been told by the education secretary to ensure universities make "greater and faster progress" in helping more young people from "under-represented groups" into higher education. Out of 345,635 first degrees awarded to UK-domiciled students in 2018, 11% were awarded to Asian ethnicity students, 6% to black students and 5% to mixed and other ethnicity students, according to the Higher Education Statistics Agency. Novlet is pleased to be able to do her bit to try to improve these statistics - and for something meaningful to have come from her daughter's death. "People invite me to events and I speak about the trust and that's something I'd never dream of doing before," she said. "I have to keep thinking that it isn't for me, it's for Demi. "If we can help other people get to where Demi wanted to be, it would feel like her death was not as much of a loss."